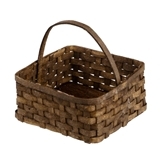 Complete the aesthetic of your dollhouse with our collection of miniature baskets! If you need a place to keep your miniature magazines or something to bring flowers or vegetables in from the garden, we have you covered. 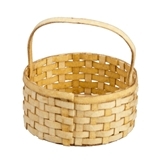 We’ve got doll baskets in a variety of different shapes and sizes for whatever you need to carry through your dollhouse. 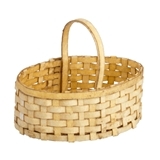 Some of our doll baskets even have handles – the easier to carry a basket of goodies, or suspend one of these “woven” baskets from the ceiling of your dollhouse kitchen! 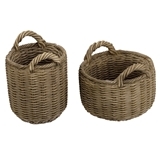 These miniature baskets are a great match for a rustic cottage, farmhouse, or garden set-up. Even a grand mansion can use a basket or two. Maybe decorate a child’s playroom with a basket full of adorable toys, or put something by the stairs for shoes? 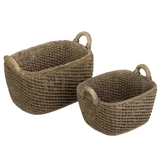 Our mini baskets are ready for anything. 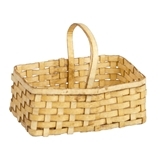 Take a look at our collection below and find the miniature basket that fits your dollhouse!